When it comes to choosing toys for your toddler, you may feel overwhelmed with all the different options. The toy market is flooded with toys that are supposed to help your toddler learn the basics or just keep them occupied so you can get some things done around the home. One of the best toys you can invest in for your toddler is a quality train set. There are many different train sets on the market and some can be quite pricey, especially when you consider all the extra sets and accessories you can purchase to go with the set. The most important aspect of choosing a train set for your toddler is to find one that is made for their specific age range. Some train sets are made with larger pieces that are easy for small hands to put together and don’t contain parts that can be a choking hazard. Other sets may require an adult to assemble the track before your child can play with it. You may wish to choose a wooden train set as these have a classic look and feel and are usually designed to hold up to many years of use. The following is a list of the top 10 best train sets for toddlers. 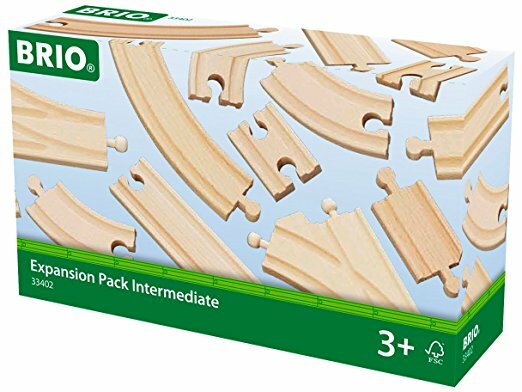 The BRIO Expansion Pack Intermediate set comes with 16 pieces of curved and straight track sections. 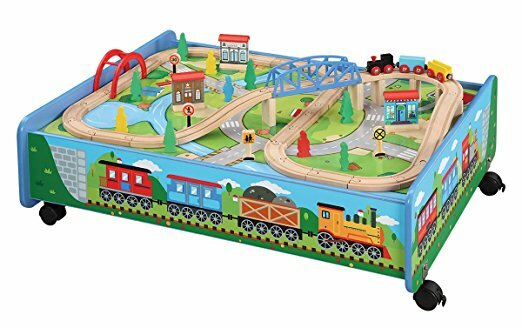 The tracks are made of durable wood and are compatible with several other wooden train track configurations from other brands. This set also includes 2 special switch tracks that give even more options for setting up a complex track system. This set from BRIO is carefully engineered so pieces fit together snugly and easily, but are also secure so they don’t come apart during play. The track sections are designed for use by children ages 3 and up. Each piece is made of 100% FSC-certified solid beech wood. The KidKraft Waterfall Mountain Train Set and Table comes with everything you need to set up an interactive train play set in your home. The included table is designed to hold the entire track included along with all the accessories. The set also comes with 3 plastic storage bins that can slide under the table to store pieces when not in use. 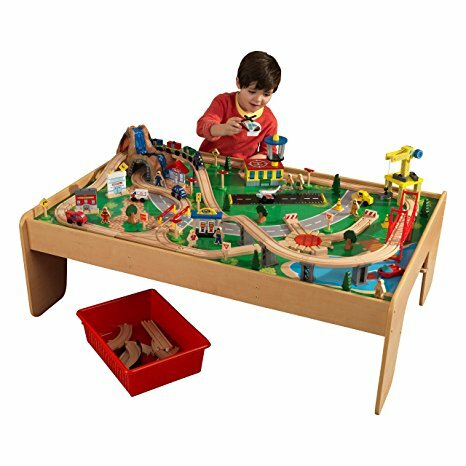 This train table set can also be used for other activities when the tracks and accessories are removed. The table is made of durable materials and it has a painted landscape for creative play. The set includes trains, tracks, a waterfall/tunnel, a crane, and much more. 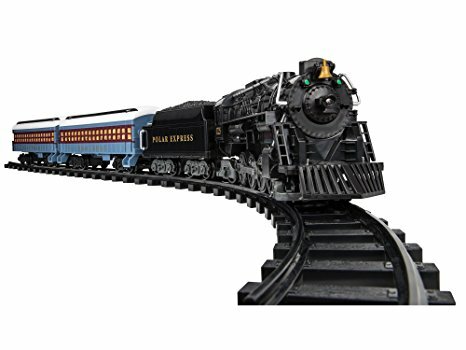 The Lionel Polar Express Ready to Play train set will delight all children who are fans of the Polar Express movie. This train set is very detailed and is better suited for older children who don’t put small pieces into their mouth. The set comes with 24 pieces of curved track and 8 pieces of straight track, along with fixed knuckle couplers for easy assembly. This train set from Lionel has working headlights and 3 passenger cars. The included engine is designed to resemble the engine in the movie. The passenger cars allow children to see the shadows of the passengers on the train. The set comes with a remote control for the movement of the train and to sound the whistle of the engine. 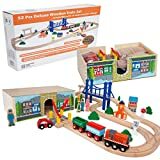 The Orbium Toys 52 piece wooden train set is compatible with many other wooden sets like Thomas, Brio, Chuggington, Imaginarium, and Melissa & Doug. This set comes with premium wooden track pieces along with an engine, a passenger coach, and a hopper car. The set also comes with accessories like a car, people, trees, and signs. This set from Orbium is ideal for children ages 3 and up. It has a bridge that the trains can go over or under and the track can be set up in several different ways or connected to your other wooden tracks. This train set also has a fun railroad crossing piece. 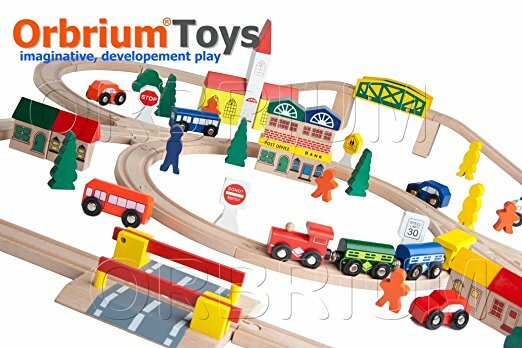 The 100 Piece Orbium Toys wooden train set would make the ideal starter set for anyone wishing to start a wooden train set collection. It’s is compatible with many other wooden trains like Thomas, Brio, and Chuggington. 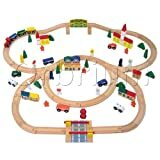 The set comes with durable wooden tracks that are solid wood and made to last. 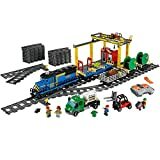 This train set has 100 pieces with accessories, trains, and other items that allow your child to be creative in building their train track and town. When fully constructed it has a triple loop layout that allows several children to play with the track at once. The set includes a train and has two 3-way track pieces for expansion. This wooden train set comes with a table/trundle for easy storage. The table has wheels so you can easily move it around the room if needed. This set is compatible with Thomas & Friends and Brio wooden train sets for easy expansion. This train set comes with 62 pieces, including tracks and a tunnel/bridge combination. The set also includes an engine, two train cars, and buildings and accessories for the background. The track can be removed from the table so the table can be used for art projects, puzzles, or other activities. This LEGO City Cargo Train Set is designed for use by older kids since it has some small pieces that may be a hazard or can be difficult for younger kids to manage. It includes everything needed to build a cargo train, along with the track and a crane to go with it. This set is also compatible with other LEGO train sets. This train set from LEGO City comes with the following mini figures: forklift driver, train conductor, truck driver, and farmer. It would make an excellent addition to the collection of those who are building their own LEGO town. The set comes with 888 pieces and is recommended for use by children ages 6 through 12. 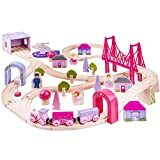 The Bigjigs Rail Wooden Fairy Town Train Set comes with 75 pieces to allow your child to build a fun and unique village. This set includes a pink bridge and a pastel colored engine shed and accessories. Also included are pastel mushrooms, trees, buildings, and fairy figures. 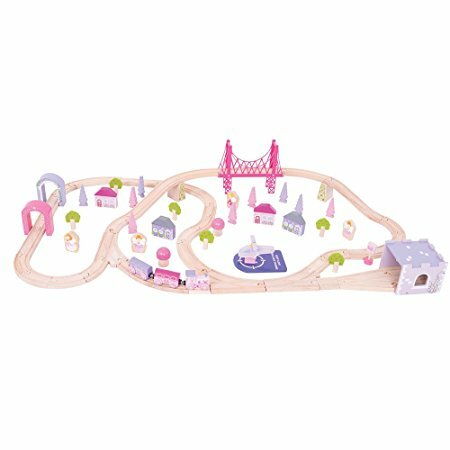 This pastel colored train set is ideal for a child who loves feminine colors but still enjoys playing with trains. The train set would fit in with pastel room decor without clashing like other sets that come in primary colors. It includes wooden track pieces that are compatible with many other popular wooden train sets so you can expand the track if desired. The Lionel Pennsylvania Flyer Train Set comes with a powerful 0-8-0 engine and coal load. This set has many small pieces and is better suited for older children. The set comes with the LionChief remote controller that allows you to easily control the engine and included train cars. This train set from Lionel comes with a boxcar, a tank car, and a caboose. The set comes with several track pieces including: 8 curved FasTrack pieces, 3 10″ straight FasTrack pieces, and 10 FasTrack 10″ wall pack terminal sections. This track is also compatible with other Lionel sets and expansion packs to make the track longer. The VTech Go! Go! Smart Wheels Train Station set is the perfect first train for a young toddler. This set can be used by children as young as 1 year old and can hold the interest of kid’s until the age of 4 or 5. The set comes with everything needed to allow your child to construct their own train set. It has a motorized SmartPoint train and uses 3 AAA batteries that are included with the set. 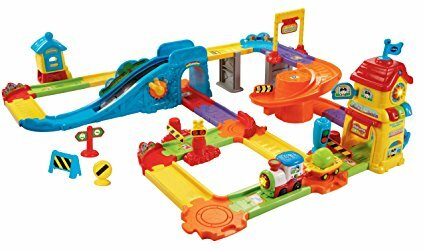 This train set from VTech has 10 SmartPoint locations around the track that have fun sounds and voices to provide interactive play opportunities for your child. It’s easy to assemble and can be done by many children without adult assistance. A train set is a versatile toy that children of all ages can enjoy playing with. There are many different brands of train sets with tracks and trains that are geared towards children of different ages. If you want a set that can be used by toddlers, as well as older children, it can be beneficial to choose a set with wooden tracks. An added benefit of wooden train sets is that they are compatible with other brands so you can easily add on to your train set collection if you want. If you’re looking for a train set for older children, there are more detailed sets that require more skill during assembly. Toddlers may still enjoy these detailed train sets but they may need some adult assistance with assembling and playing as many of these sets have small pieces. There are also some plastic sets that are specifically designed to be used by children as young as 1 year old. When shopping for a train set it can be helpful to read online reviews to find a set that is well made and designed to last.